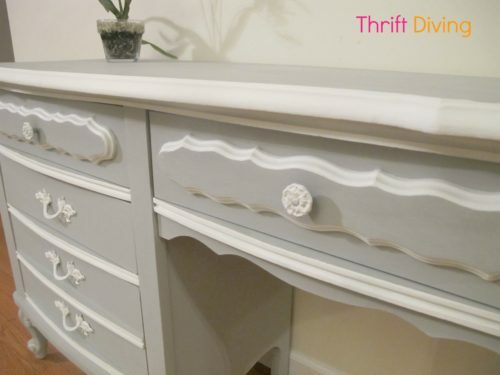 I absolutely looooove the combination of grey and white, and I’ve been dying to make over a piece of thrift store furniture with this color combo for quite a while. Enter: this beat-up (but cute style!) French Provincial desk that I picked up at my favorite thrift store. 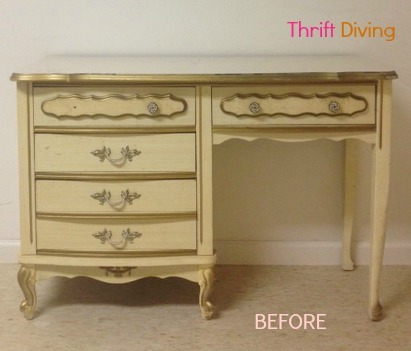 Isn’t it amazing what paint can do?! With this type of transformation, who would ever need to buy NEW?? 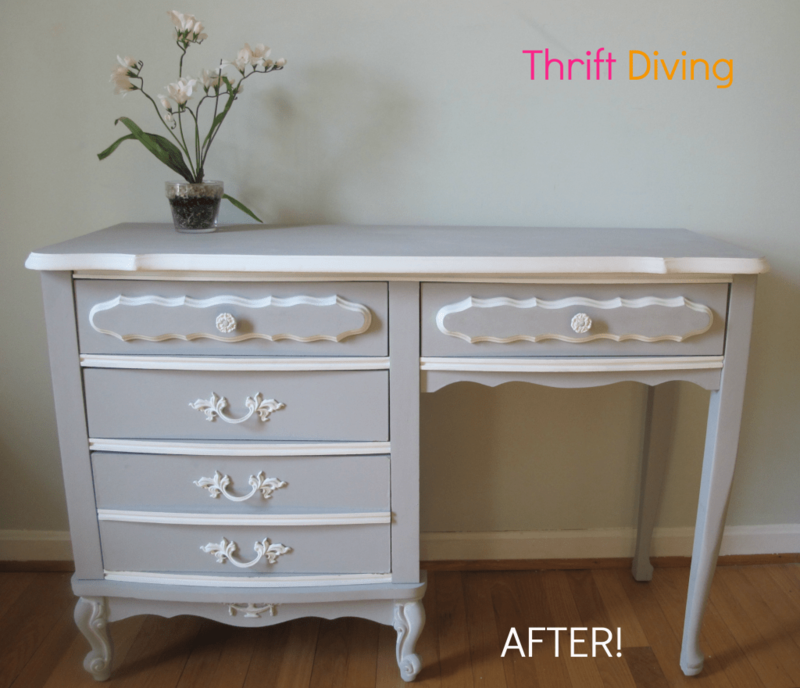 You know that when you shop thrift stores for furniture to make over, you know it’s always a toss up about whether it will require a nip here…..a tuck there…..and sometimes, a whole face lift!! Thankfully, this desk wasn’t a total “face lift” but it did throw me for a loop with a few things that ended up eating away a lot of my time! Don’t you hate when projects go like that?? What you thought was going to be a quick, easy, satisfying project ends up turning into the project that needs to just “END, already!” so you can move on to something else. Yeah, well, that was this project. Do You Ever Paint the BACK of Furniture?? I know….”Who’s ever going to SEE it? !” is what you’re probably thinking. That is what I used to say, too. But ever since I decided that I may try my hand at the ‘ole “entrepreneurial thing” (read: selling some of my stuff on Craigslist and at flea markets, which hasn’t happened YET; just gearing up), I decided that it’s unacceptable (and UGLY!!) to leave the back and bottom untouched. 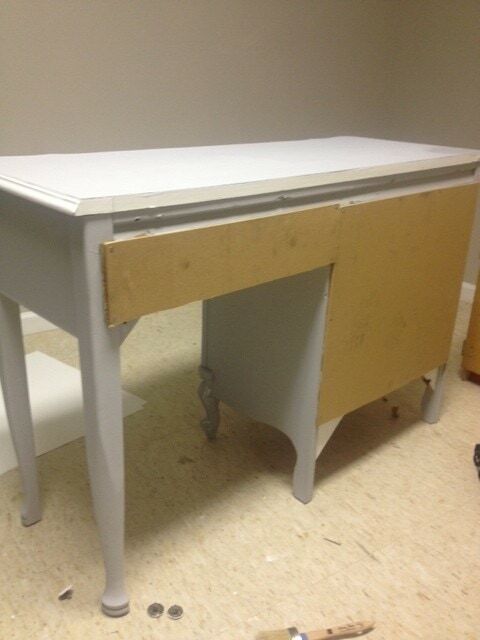 When I found this French Provincial desk, this is what the back of it looked like: covered in thick, torn cardboard MDF-type boards. It looked horrible!! First, I thought I would just remove the back and put on new backs. So I decided to cover over it with a whole new panel and just leave the existing old backing on. No one would even know! (well, unless they find me blabbing it here…..). Um…..guess where I found them? Yep! Hubby, me, and the kids were driving along and I saw about 6 of these MDF boards just SITTING on the side of the road, in the trash pile. Hello!!!! Pull over! Pull over! Hubby sucked his teeth and complained, but when I’M the one driving, he has no choice but to oblige! And wouldn’t you know, a couple of those boards came in handy for this project! I used my little Dremel Trio rotary tool to cut the sizes I needed. 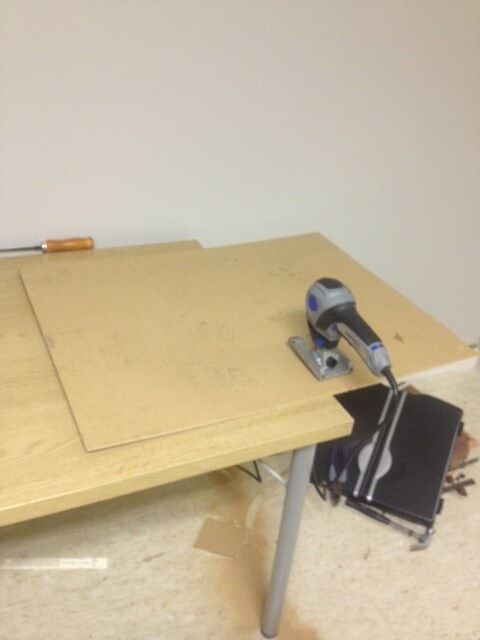 At the time, I didn’t own a circular saw, which would have been super easy. So I settled for the Trio. 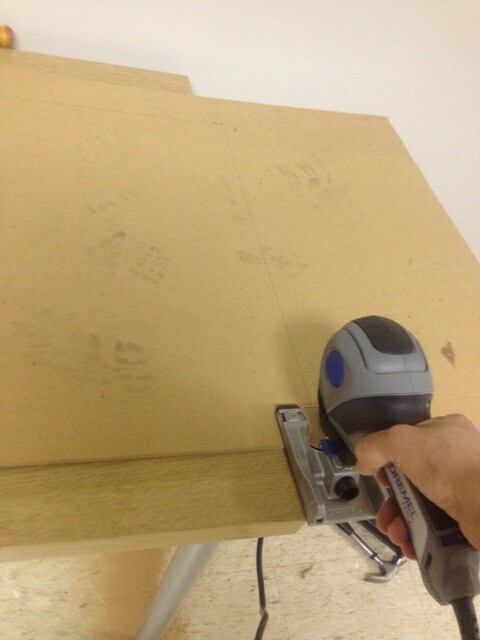 Now that I’ve got my circular saw, I’ve been doing all kinds of projects I wouldn’t have been able to otherwise do, like when I turned my toddler’s changing table into a desk! But even THIS is a major improvement over the holey back. With a coat of paint, it blends in with the rest of the body without being an ugly eye sore. Again, it doesn’t have to be perfect; but at least it’s an improvement, right?? Don’t be afraid to drill new holes for your hardware. Sometimes you want to reposition them, or maybe you just need to rework it, the way I needed to do. 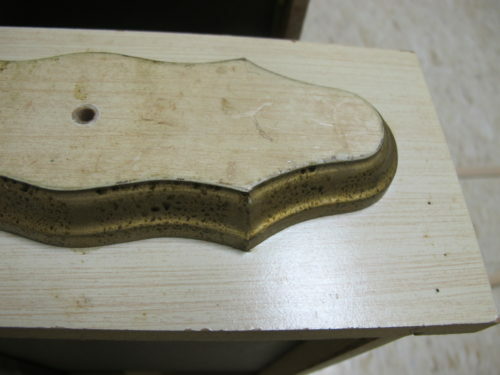 I used Wood Filler to cover the existing knob holes, then drilled a hole in the center to create just one knob hole. When the wood filler was dry, I sanded it down to blend into the wood. Pass Me the Primer, Please!!! Sometimes you just need a big ‘ole can of PRIMER. Don’t get me wrong, I love Annie Sloan Chalk Paint, especially for the reason that it sticks to everything, apparently. But one thing it DOESN’T do is act as a stain blocker. You see these drawer fronts?? OMG, horrible! 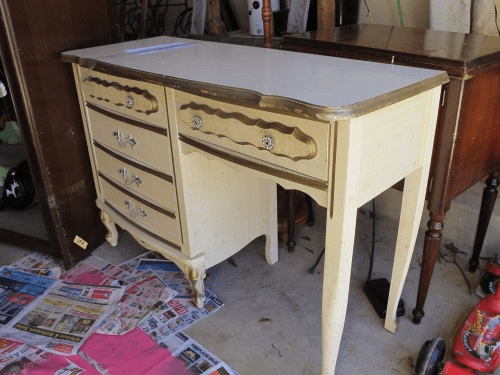 I painted at LEAST 3 or 4 coats of white over that gold trim part, and there must have been some stains or something on it because it BLED THROUGH each coat….UNTIL I whipped out the good ‘ole primer and slathered on a coat. Worked like a charm! I kept the existing hardware because it had such a nice shape. I just painted them white, too. 1) Primer will NEVER go out of style! 2) Sometimes hiding a flaw is just as good as correcting it! What are some of YOUR Lessons Learned from doing projects? Please leave a comment! « BEFORE and AFTER: Makeover of a Wooden Play Kitchen! My daughter has this set less the desk, I have been looking for the desk everywhere and I found this and am enthralled with how you changed it! Gives me an idea for her whole bedroom! Do you know where I can find a desk like this? Check Facebook marketplace! 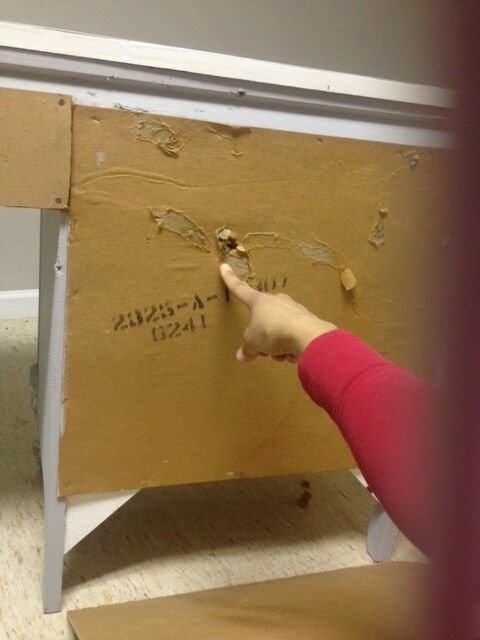 That’s how I found mine (this sane desk) and since I’ve purchased mine I’ve seen 2 more in my area! 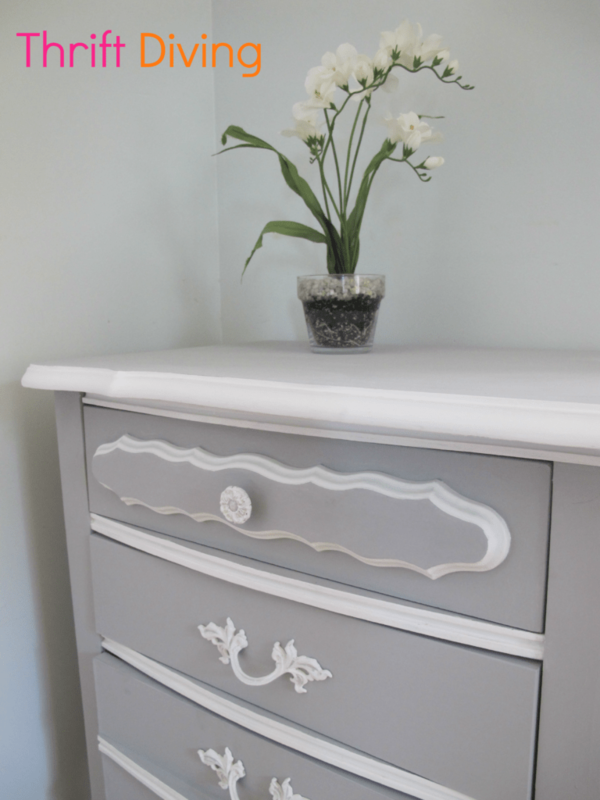 How do you paint the grey so cleanly around the white front of drawers? I am painting my jewellery armoire and the paint keeps going through the tape. Tape it off then paint it the same color the tape is covering that way when the paint bleeds through the tape (and it will) it will be the same color. Let that dry and then paint it the color you actually want it to be. Hope that makes sense! This is also how most people get such clean lines when painting stripes on a wall. 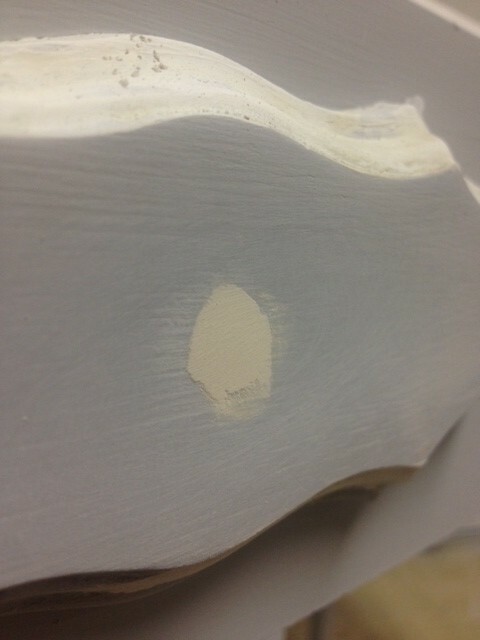 Do you need to sand or remove any of the old paint before priming? I have a full set of this style furniture and I’ve wanted to refurbish it, but some people say that you need to sand it down first. Does it make a difference? I have this exact bedroom suite that I am going to chalk paint as well. My question is: the tops are all laminate. Did you paint right over them, or leave them alone? 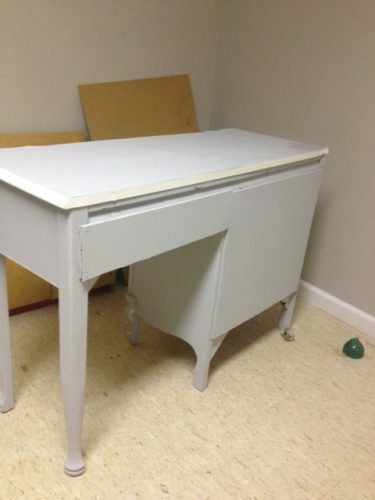 I can’t get over how meticulously you painted those fixed drawer pulls on the desk. How on earth did you paint under them? I know, carefully. Going to follow your instructions to the letter; wish me luck. Have a Highboy, low boy, and blanket chest to conquer. Hi, Maxine! LOL, very carefully indeed! It’s called the Lazy Girl’s way of painting! Can you please tell me the colors and brand of paint you used? I love this piece! Hi! I have this desk on my porch ready for a redo from childhood to my daughter. 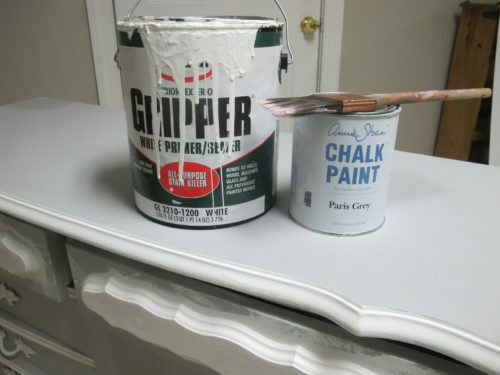 I want to use lt grey chalk spray paint and then white wax just to make it look white washed or something. Would the spray paint work ok? I wouldn’t recommend using spray paint. Unless you’re very skilled at spray painting it won’t have an even coat. I’d highly recommend using a foam roller for the majority of it and a paint brush for the details. If you do choose to use spray paint, be sure to prime it first. I’m trying to figure out why on earth you would want to cover the gold paint on this classic piece of collectible furniture… I also have this set, from the 1960s, I’ve seen these sold in antique shops for a lot of money. Good riddance! That 60’s charm was so icky. 🙂 The style is great, but not the finish. Well put! Like other charm from the 60’s….if you don’t have anything nice to say, don’t say anything at all. You did a lovely job. The extra attention to the back will be appreciated by anyone purchasing. Yes, these kinds of pieces are so nice. They feel super feminine and fun for a young girl or even old girls like us! 🙂 HAHA. 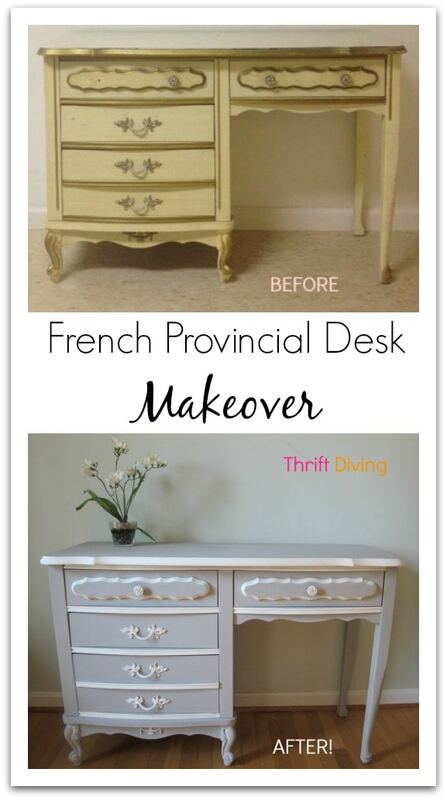 I see them all the time, but some places charge a LOT for French Provincial! I need to know something. I want to do this specific design except maybe a darker grey. 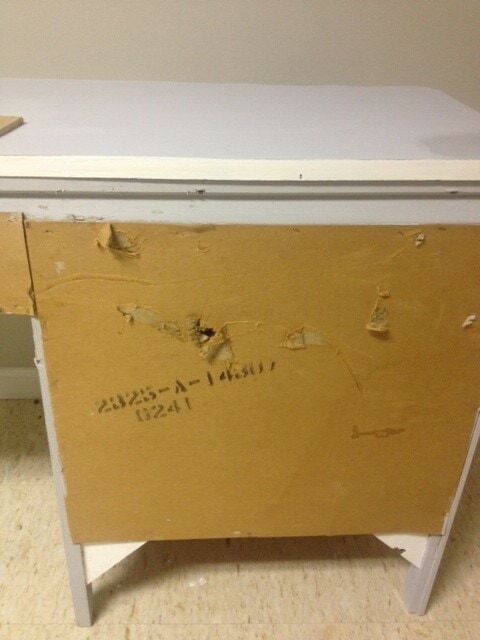 But I was told if you even slightly run your fingernail on it that the chalk paint will come right off in a streak. 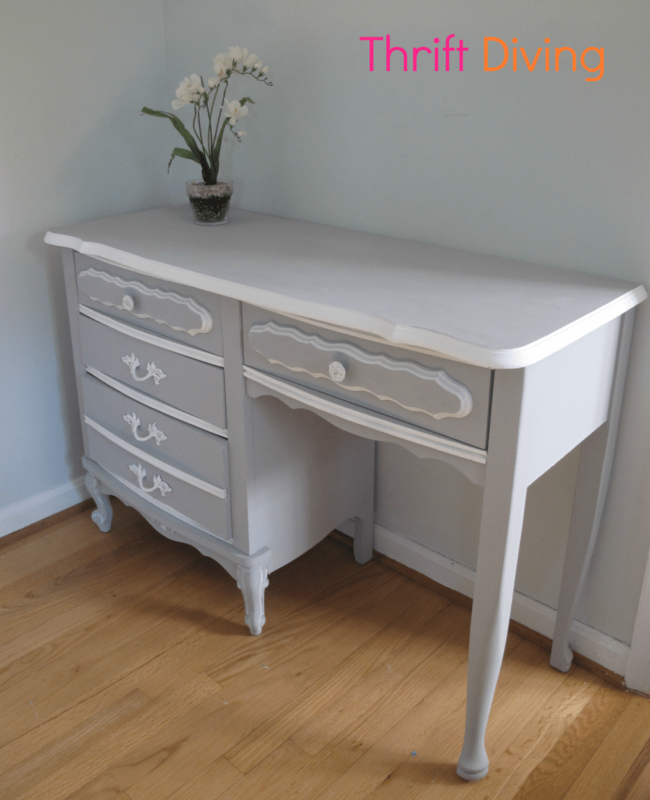 That you need to wax it after painting and priming which makes it glossy and defeats the chalk paint purpose, and it totally to be around $90. I want to just prime and paint. 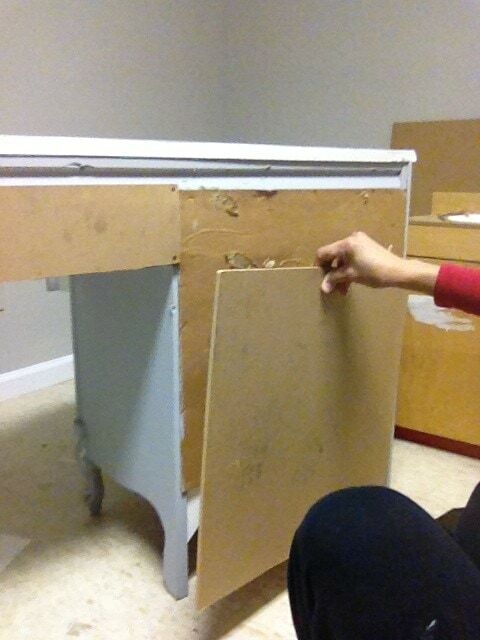 I have this exact desk in good condition. I may have skipped over the answer already, but I was wondering. How do you redo the top? 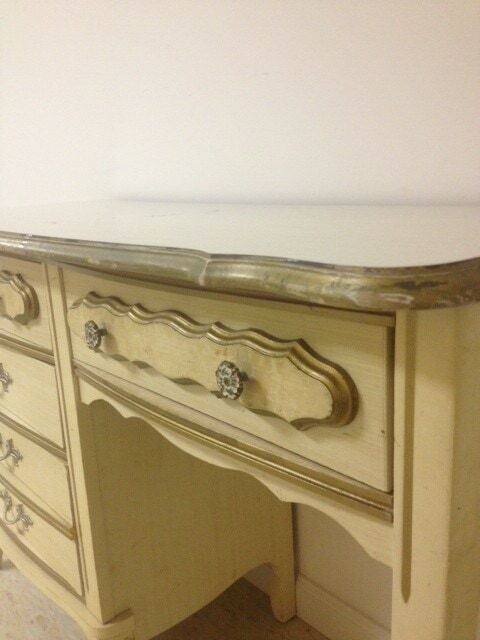 I have a piece that is the yellow color and the top of the dresser is like a white laminate. 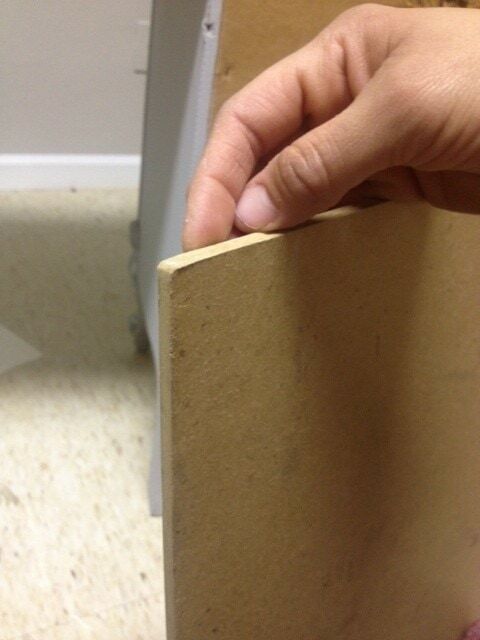 What do you do to paint that part, sand it or just paint over it? Thank you in advance. Beautiful desk! How did you get the drawer pulls off? 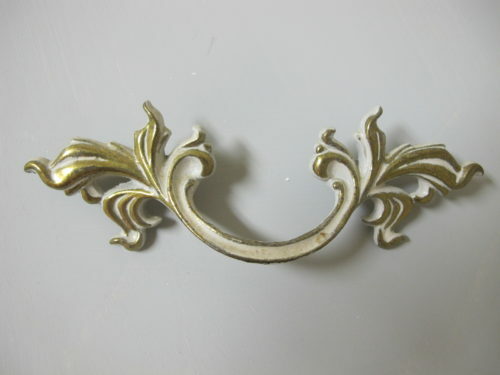 I just thrifted two identical pieces to yours and cannot seem to remove the hardware. 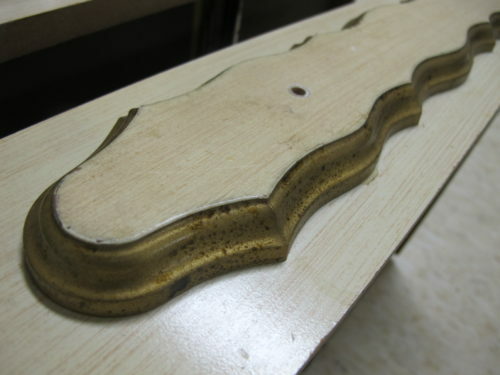 The backs of the pulls are completely round – so a drill or Alan wrench will not work. Please help! I have the same issue. 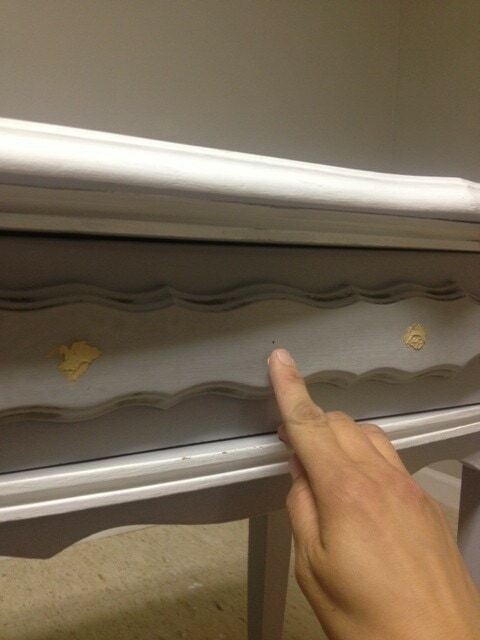 How do you remove the drawer pulls without damaging the furniture? The pull seems to be held in place by some sort of rivet/collar.